Family vacays are the best! Atleast that is what Sandhya Sriram found on her four day family rendezvous at Phuket. She shares the recipe of her perfect family vacation to Phuket. We guarantee you that at the end of this read, you’ll be waiting to pack your bags to Thailand. And we have an itinerary made just for you, at the end! I love beaches – the white sand, the blue/green waters, snorkeling, being on a boat (even though I get sea sick sometimes), just chilling, having a melon-mint cooler, fresh fruits, tons of sunscreen and massages… Aah! the massages… wish I could get one right now. One such was our 4 day vacation to Phuket, Thailand, with my husband, mother, friends and my son. It was my son’s first ever vacation! The flight time from Singapore to Phuket is approximately 2 hours. Travel with kids has its perks but with some difficulties that can be overcome. We visited in the month of December, while it was still hot and sunny with a typical tropical hot, humid weather. We reached our hotel on Patong Beach in the afternoon and decided to visit Phuket Fantasea that evening. 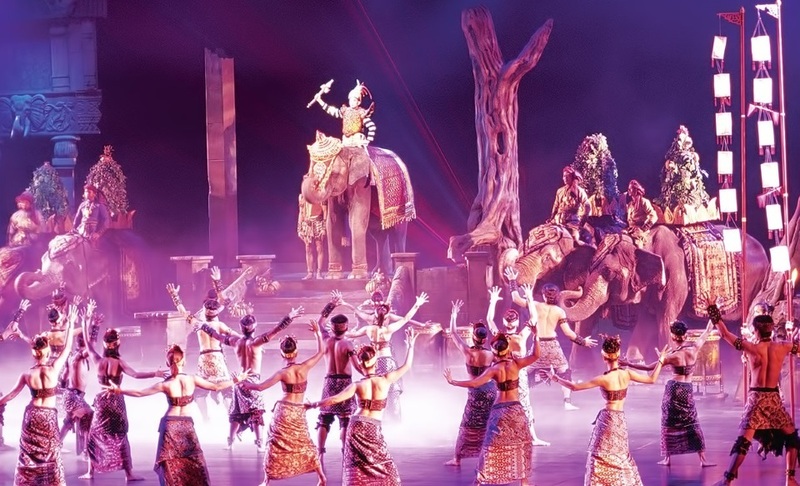 A Thai Cultural Theme Park, Fantasea is super fun for both kids and adults. There are many games to play, puzzles to enjoy but, best of all are the grandiose man-made sculptures and huge structures that greet us along our walk here. The ticket is inclusive of dinner – a yummy treat laid out in a larger-than- life dining hall. There were lot of vegetarian and Indian cuisine options, too. Following dinner, an amazing show was put up – featuring animals, acrobatics, beautiful sets and screens, dance and music. Unfortunately, video recording or photography is disallowed, hence no photos to show you the magnificence of it! The next three days involved early mornings and lot of beach-side activities. Just opposite our hotel, there were numerous Indian restaurants and tour companies. It was a boon given my mother and son absolutely needed Indian food. The day started off with an awesome river rafting experience – although my kiddo had to stay behind with my mother. 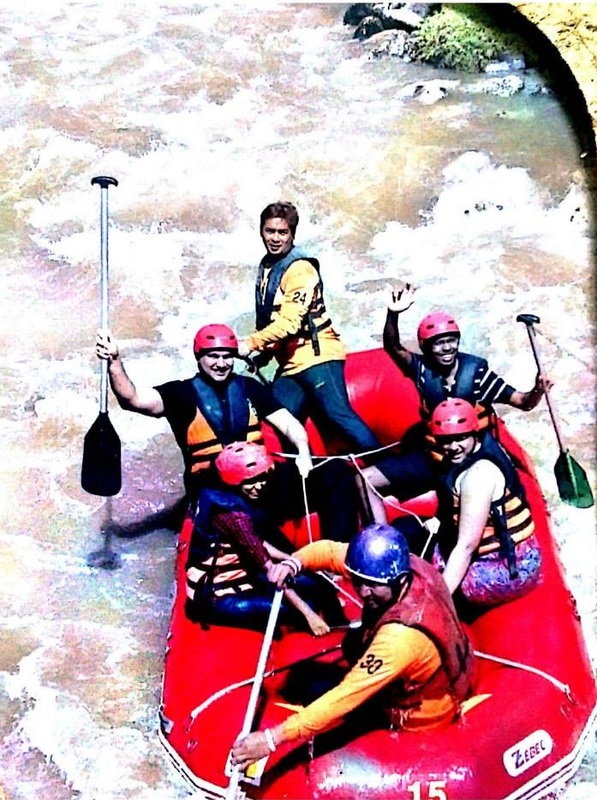 It was my first ever river rafting experience. And I have to say I loved the adrenaline rush and the thrill of it. 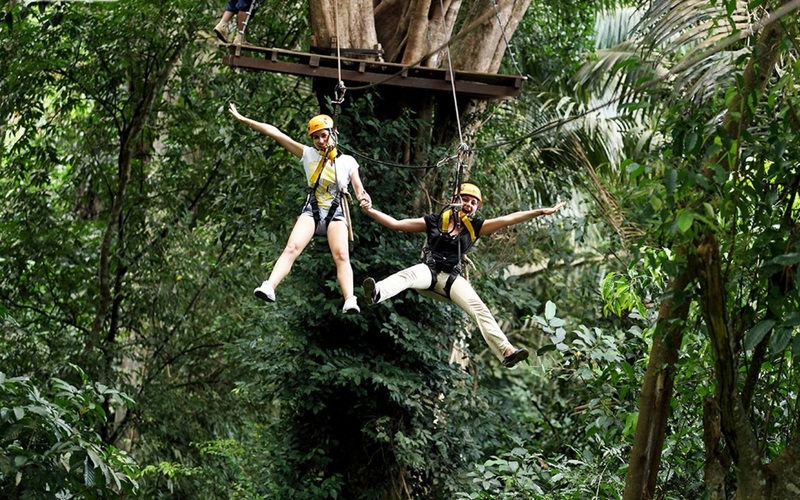 Then we immediately went on the Zipline – my first time again and it was exhilarating! Our tour guide then drove us to the Elephant Park. On the way, we stopped to visit a Buddha temple. Set inside this dark cave, the beautiful gold Buddha looked and gave serene vibes. At the Elephant Park, we saw shows with baby elephants and went for an elephant ride as well. But recently I have been watching some videos on how these elephants are being abused; hence I would not ride or do it again. 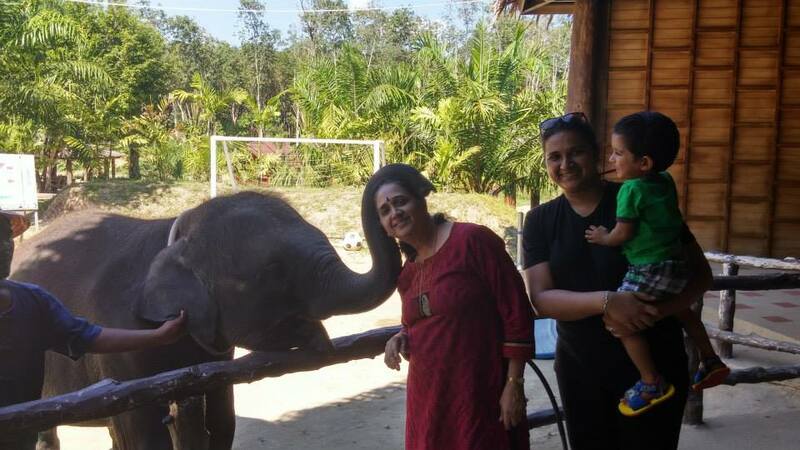 My son thoroughly enjoyed watching and touching the baby elephants – he was delighted! At the end of the day, we walked along the Patong Beach and Bangla Walking Street, where shopping is a must-do! Prior warning, it is super crowded everyday. Street food, dance and performances, drinks, toys, clothes, accessories and other activities are the essence of the walking street. Our third day began early too, since we had an hour drive to the ferry pier to take a boat for another hour of island hopping and visiting Phi Phi Islands. I must say the Phi Phi Islands, even though crowded, were absolutely beautiful! 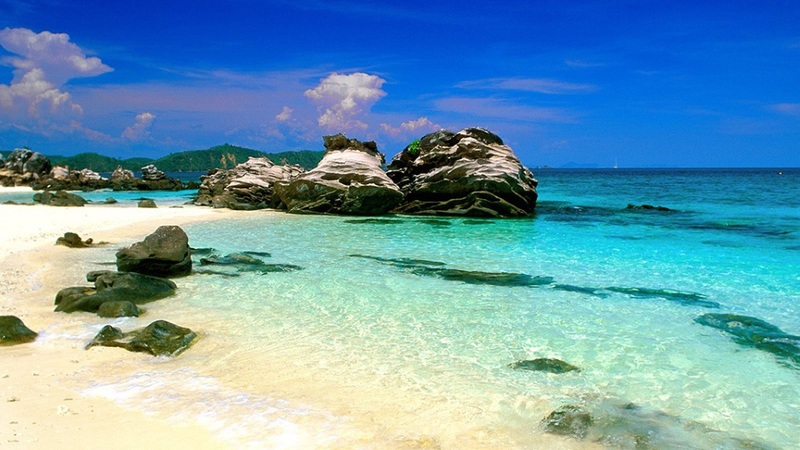 The clear blue-green waters, the white sand beaches, the greenery all around were all breath-taking! 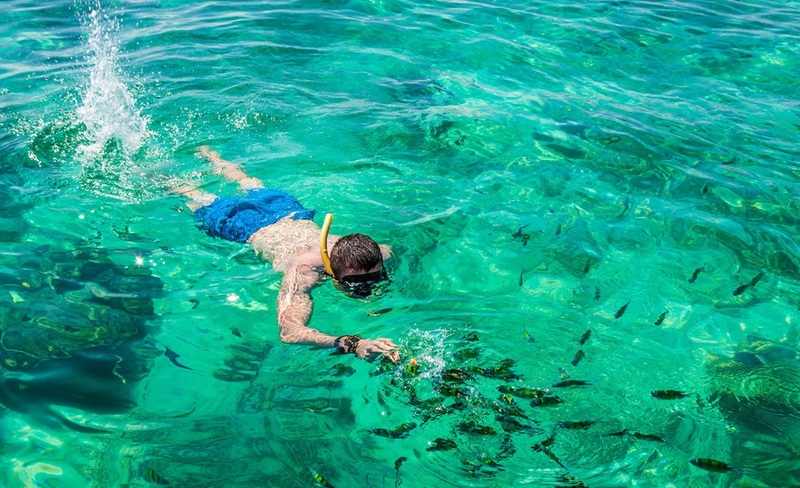 We did snorkeling in the middle of nowhere and it was truly awesome – even my kiddo loved swimming, with safety gear on. We saw beautiful corals, fish, and sea creatures and it was like another whole world down there. My son fed the fish and was fascinated by all the fishes swimming around him. The last day was action packed as well. 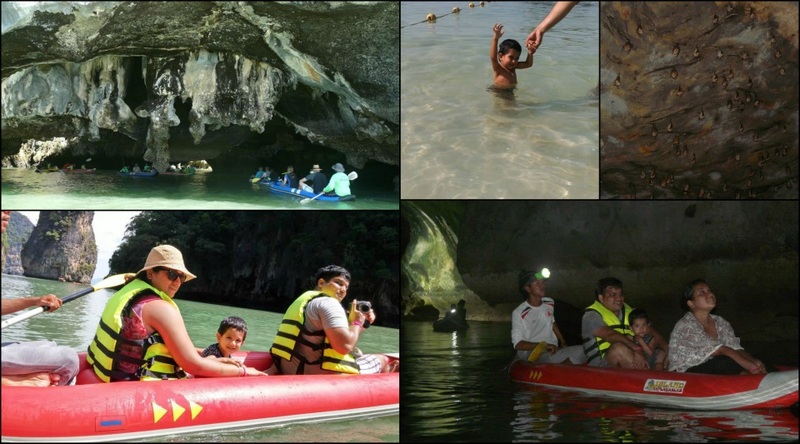 Visiting Phang Nga Bay, James Bond Island, we tried our hand at canoeing for the first time. 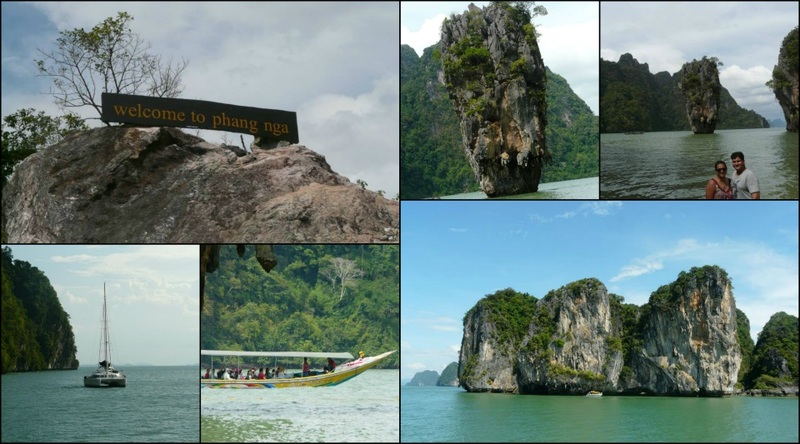 James Bond Island gets its name after being featured in James Bond movies. It is home to a huge limestone rock that is famously photogenic – featuring in many photographs and profile pictures. We thoroughly enjoyed canoeing – even my mother. Going through the dark, low lying caves to see the bats and sunlight shining through the trees was a beautiful experience. With that our trip came to an end and we had to come back to Singapore – back to reality. This Phuket vacation was special since it was our first vacation with our son and we enjoyed every second of it. #2 Always carry a hat, umbrella, cap. On the same note: sunscreen, sunscreen, sunscreen! #3 While island hopping, remember to eat light and in frequent intervals – especially if you are prone to sea-sickness. #4 Spend a day, at least, slacking off getting massages here – they are affordable, too! #5 Ironically, international cuisines are more prevalent than Thai food in Phuket. Craving Indian food? Don’t worry, there are plenty of affordable restaurants in Phuket and Patong. 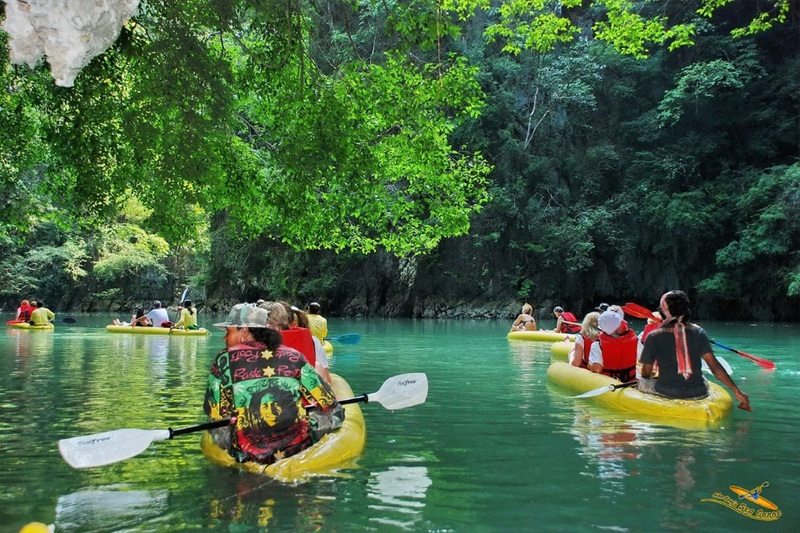 #6 While rains are a pretty sight in Phuket, avoid travelling in June – especially if you have island hopping planned. December through March is the best time. #7 For a bit of peace and quiet away from the crowds, head to Laem Ka beach – hidden from the public eye so it is a bit of a find! If you are looking to plan a similar trip, here’s an itinerary that we made up for you. Go ahead and play around and make your vacation dreams come true. Confessions of a digital nomad – Is the nomad lifestyle for you? Most iconic filming locations across the world! Hey! Thanks so much 🙂 Hope you have fun on your rafting adventure! Great post! Planning a trip to Bali later this year, hope it will be just as great!